Everything you need to know about viewing the eclipse in Elizabethtown, Ky.
(Elizabethtown, Ky.)—For a period of about 3 hours on Monday, August 21, the moon will slowly move across the sun, creating what is called a “partial solar eclipse.” The partial solar eclipse will be visible across all of America. Some parts of the world will experience between 1 second to 2 minutes and 40 seconds of totality, or “total solar eclipse,” where the sun will be completely blocked by the moon. Totality will only be visible to cities located within the 60-mile wide band located on the map below. Though Elizabethtown is not in the path of totality, residents and visitors in Elizabethtown should be able to see a partial solar eclipse, beginning at 12:59 p.m. E.T. The maximum eclipse will occur around 2:28 p.m. E.T., and the end of the eclipse will occur at 3:52 p.m. E.T. The Elizabethtown Community and Technical College will host a solar eclipse viewing at 11 a.m. E.T. on August 21 in room 212 of the Regional Postsecondary Center. It is never safe to look directly at the sun’s rays, even if the sun is partly or totally obscured. Please wear eclipse glasses at all times while viewing the partial eclipse. *For a list of reputable vendors that make/sell solar eclipse glasses and viewers, click here. *ECTC will also hold a solar eclipse viewing on August 21 beginning at 11 a.m. 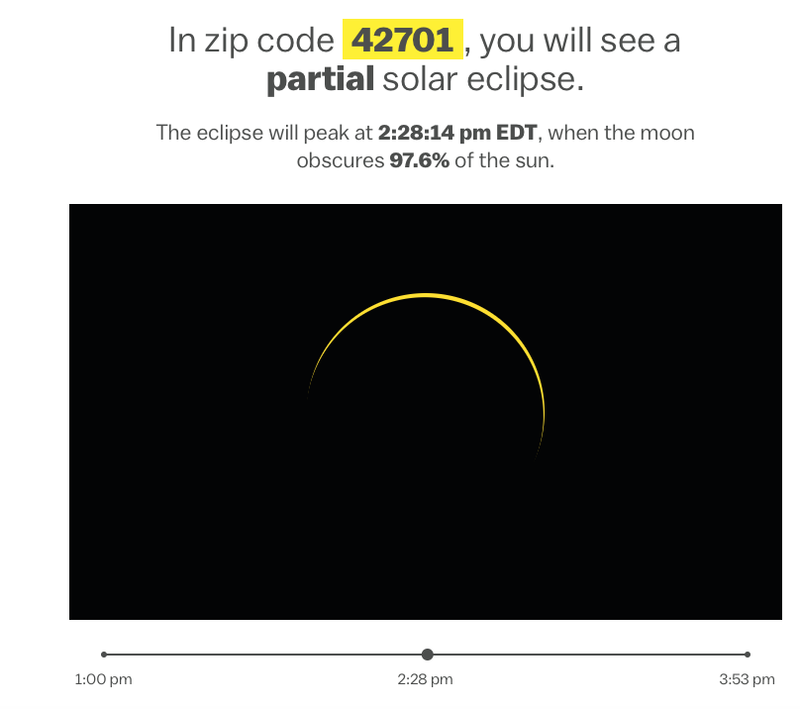 The image below is what you can expect to see in Elizabethtown on August 21 at approximately 2:28 p.m.
Edit: An earlier version of this article listed the eclipse start time at 4:59 p.m. E.T. instead of 12:59 p.m. E.T. and has been updated to reflect this change.